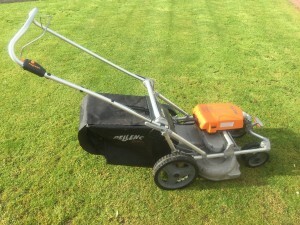 I had been looking forward to getting a look at the Pellenc Rasion professional battery lawn mower for quite a while. 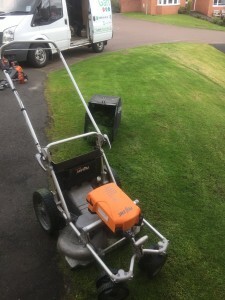 Lawns, professional lawn care and lawn care machinery are really important to the lawn care side of our business (The Lawn Advocates), and I had been researching lots of different lawn mowers to use within the business. I think I had watched every YouTube video I could find on the Pellenc lawn mowers, and I was keen to learn more about them. Etesia (http://www.etesia.co.uk) are the UK distributors of the Pellenc range of professional battery operated machinery. It’s very likely if you have an Etesia dealer near you, you will be able to take a closer look for yourself. I’m fortunate to have an Etesia dealer local to me in East Kilbride – Alex McDougall Mowers (http://www.alexmcdougallmowers.co.uk). I was delighted when Jennifer from Alex McDougal Mowers contacted me in May of 2017 to say she had a demo Pellenc Rasion lawn mower I could try out. I wasted no time in picking up the mower and used it on my regular lawn maintenance schedule the very next day. I had formed the impression from photographs and videos that the Pellenc lawn mower was a dinky little thing. It’s not. It has a 60cm cutting deck with twin cutting blades. That’s about 10 – 15 cm wider than the mowers I use everyday. The Pellenc lawn mower is also quite light. The specifications on the Etesia website say it’s 20kg. That’s about half the weight of my regular mower. 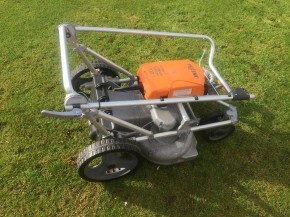 The weight does however get a bit heavier when you add on the weight of the battery, but this can be removed quite easily if you need to lift the mower onto a van or onto some hooks in a garage or into a storage unit. I managed to lift the mower on and off my van on my own, with the battery in place, with no problems at all. Something else that might catch your eye about this mower is the front wheels – they swivel! Swivel wheels meant I could actually turn this lawn mower 360 degrees with one hand. There was very little pressure on my wrists. 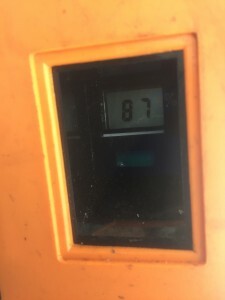 This might not seem like a big deal, but as many people who mow all day everyday will know, operator fatigue can be an issue when using lawn mowing machinery for many hours. There are no pull cords to operate and no fuel to add. All you need to do is ensure the battery is charged, press the start button and engage the safety cut-off lever. There appears to be a slight delay and then you hear the blades whirr into action. It’s nothing like the sound of a petrol mower engine – because the Pellenc Rasion battery mower has no engine. It really does just sound like a whirring noise. It’s not silent, but it is much, much quieter than a regular petrol mower. I guess it sounds a bit like using an electric mower. It has that sort of sound and feel to it, albeit it’s much more powerful and there is no power cord to worry about or to get in the way. 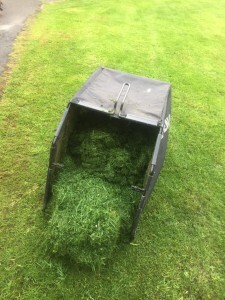 I put the mower through its paces in a good test – real life lawns, on their fortnightly cut. Everyday gardens with twists, turns, obstacles, lumps and bumps, shorter grass and fairly long grass, and slightly damp. It did okay. Not brilliant, but okay. The wide deck doesn’t like uneven ground – it scalped a few areas. This is to be expected with a wide deck, so care needs to be taken. It picked up reasonably well, even on the damp grass. However, one particular lawn had quite a thick sward of long grass and the mower cut out. Oops! I raised the deck and went through the simple starting process again and all was well. My regular petrol mower would have eaten that grass with only a slight labouring of the engine. It didn’t bother me too much. It was important to test the limits of the Pellenc mower in real conditions and that’s what I was doing. I made sure the deck was raised a little for my next lawn, and lowered it a little for the second pass. The mower then performed really well. The Pellenc mower doesn’t stripe, so don’t expect that type of finish. However, it does leave a smooth, good looking finish. On my flatter lawns it was almost effortless mowing. Turning on those 360 degree swivel wheels was a breeze, and all the clippings were picked up without any issues. When I switched back to my regular mower for some of the smaller, less even lawns I could really notice the difference in weight, noise and movement. * lawns of approximately 200 – 300m2 & using the 1100 battery. That’s not too bad, but could be a bit of a problem on long summer days with a lot of lawns to get through. I’d want a back up battery to be sure I didn’t run out of power. I really liked using this Pellenc lawn mower, but for me the acid test is, would I give up my less expensive all-rounder petrol mower for this more expensive battery mower? If I had perfectly flat lawns that weren’t needing a striped roller finish, the answer would be yes, possibly. Unfortunately, the lawns I have that are ideal for the Pellenc lawn mower are getting what I believe to be a better cut with my roller mower (albeit the roller mower is really heavy). What could tip the balance in favour of the Pellenc lawn mower would be user fatigue. If I got to the stage where mowing was becoming difficult due to vibrations, weight, noise, fumes – then I’d switch to the Pellenc mower (+ 2 batteries). It doesn’t matter if you are a professional user or domestic user – if a mower can give you almost effortless mowing, you’re going to want to give that mower a go. The price of the professional range of Pellenc lawn mowers is likely to put off most light domestic users, but to a professional who is concerned about operator fatigue, noise and fumes, the Pellenc battery operated lawn mowers may well be an option to consider. Thank you to Pellenc, Etesia, and especially to Alex McDougall Mowers in East Kilbride for giving me the opportunity to try out the Rasion mower. I really enjoyed it. There is now a wide range of professional battery operated garden and grounds care machinery on the market. From hedge trimmers, to lawn edge strimmers, to leaf blowers and mowers (Stihl, Pellenc & few others). There are also machines aimed at the domestic user (Alpina & many others). It may be worth checking them out the next time you are looking for new garden machinery. If you don’t get excited about garden and lawn care machinery, and you’d rather spend your time doing something else other than mowing your lawn, then please feel free to give Mr & Mrs Gardens Limited or The Lawn Advocates a call.